Bold colors plus white, military, leather, leisure suits and oriental are all the rage this fall and for winter 2013. Prints are everywhere, especially with leisure suits, which are making a big splash this fall and winter. From Prada to Stella McCartney, the trend is to use bold, bright, eye-catching colors. While accompanying single-color pieces will keep the look balanced, this fall and winter is also about fun, so try contrasting patterns with your prints. 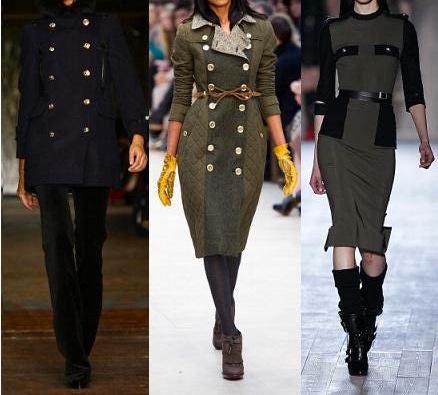 Military and oriental fashion looks will be wardrobe staples for the style-conscious woman this fall and winter. While the luxurious fabrics and bold colors of oriental fashion might seem in stark contrast and a contradiction to the more regimented, mono-color look of military fashion, the two are primary design trends for this fall and winter. Leather will again be a big part of the fall and winter season. However, this time around leather is getting color, with a focus on leather coats and skirts. With all fashion this fall and winter, oversize will play a larger role than ever before. While form-fitting remains a constant, oversize coats, trousers, sweaters and extra wide jackets are all part of designer fall/winter collections. Colors to look for this fall and winter include purples, red-wine, emerald and teal greens, bold oranges, and fuschia. Winter white has always been a part of the fashion mix. This fall and winter, it will be a major part of the wardrobe selection. From fabric and leather coats to pants, skirts and sweaters, winter white is all the rage. But be playful and offset your winter whites with bold colors in scarfs, shoes/boots and hats.